When Mr. ThreeYear and I decided to turn our financial lives around in 2008, we had a lot to learn. When we first started to budget, we wasted tons of money on what we now consider unnecessary expenses (things like alarm systems, cable, and yard service). We were living in Atlanta at the time, and the dominant culture in that city can be a bit… showy. Since public transportation is limited there, as it’s one of the most spread-out metropolitan areas in the country, cars are a must. And one of the most popular Atlanta pastimes seems to be car one-upmanship. There was even a Lexus Lot at Turner Field, so that Lexus owners could park their cars in an exclusive lot much closer to the field. We were driving a BMW and an Acura at the time (although they were both very used), even though we had debt. Then we moved to New England and we were exposed to a completely different culture. In the rural New England hamlet where we live, people like to say that they’re of hardy stock. After all, you have to be tough to brave seven months of snow, mud season, and the fierce weather that characterizes the very northeastern-most region of the country. Natives of this region are often seen in January in nothing more than plaid shirts, jeans, and boots, with temperatures in the teens (that’s roughly -10 for you users of Celsius). Illustration: You have to be tough to get outside in all types of weather. My running friend called me yesterday, on Mother’s Day. 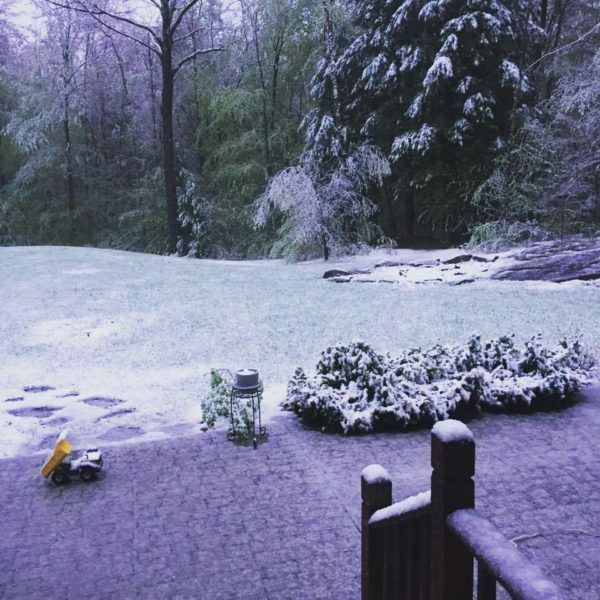 We woke up to snow–yes, snow–on May 14th. And ice and rain. I don’t even know how that combo is possible, but somehow it was. She wanted to know what time we were going running. “I’m currently lying in the bed binge-watching Catastrophe,” I told her. “What are you talking about? It’s horrible out.” She reminded me that we’d run a marathon in the rain–once, and I think I was going through a mentally unstable period while training for that–and that rain was really no excuse (we didn’t run. I talked my way out of it. I’m still not hardy). Happy Mother’s Day! said cruel Mother Nature. How in the world can you call New Englanders anything other than hardy stock? My Southern self was still shedding inner tears that I had to look at snow in May. New Englanders are also frugal. It seems to be in their blood. It makes sense, given that this region is really hard to get to, and goods and services are in shorter supply. It’s why food is so much more expensive here. Our own growing season is short, and shipping food in is cumbersome and difficult. I went to my first New England yard sale and realized that the phrase, “Use it up, wear it out, make it do or go without” was still taken to heart here. I have never seen such worn-out clothing that someone wanted money for! New Englanders are the opposite of showy. They are understated. Fancy cars are a no-no in this part of country. If your net worth is upwards of $10 million, you still drive a Subaru. Or a Prius. Take your pick. The only thing New Englanders tend to be showy about is their craft beers. We have tried Alchemist, Second Fiddle, Boom Sauce, and many more, thanks to friends’ generosity (“Oh, I picked these up the other day…”). Despite our nine years of work on shaving expenses and becoming more frugal, we still have trouble with spendy-ness. I still have trouble, I should say. ADT Security: $33/month (again, what a waste of money. The only time we ever used this was when we accidentally set off the alarm and triggered the police, fire department, and next door neighbors to come over, in that order). Fun money: $849.50/month. What in the heck were we doing? We definitely did not have that much fun, mainly because I was hugely pregnant and couldn’t even blow that on fancy wines if I wanted to. The fact that I have zero memory of where that money went boggles my mind (pregnancy brain, probs). But most importantly, why weren’t we putting that $850/month towards the credit card balance? Fuel: $400/month. I don’t know why it was this high, but we had cars that were much less gas-efficient than we do now. We achieved it using Octane Holding Solutions. Cell phone: $87/month. We both had Verizon. Home-equity loan: $308/month. This was to avoid paying mortgage insurance–we borrowed enough to make our 20% downpayment. Car payment: $267/month. Cheaper than before but we still had a car loan. Fuel: $200/month. Thanks to a fuel-efficient Prius, we’ve cut our driving costs in half. We were hitting $150/month before I took my second gig in a neighboring town, but since I’ve doubled my income the extra $50 in gas costs has proven worth it. Cell Phone: Down to $52/month. Mr. ThreeYear switched his phone to his office plan, so we no longer have to pay for it. I tried out Republic Wireless for six months, but unfortunately, it was a disaster. We have terrible phone reception in this part of the country so the only service that works is Verizon. I currently pay $51 and change per month. Car payment: Yes we still have the car loan! We’re killing it (forever!!) this year. It has a very low interest rate but we’re still paying interest so I’m ready to be done with this budget category! 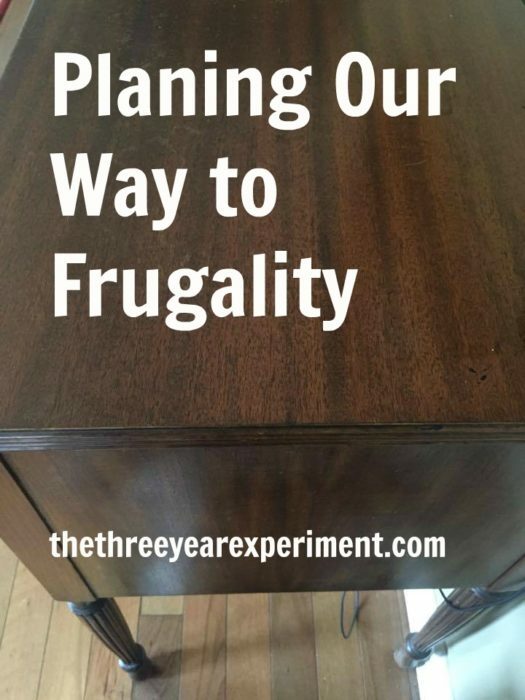 For our family, frugality has not been a switch that we were able to turn on. It has been more like a wood planer, such that we’ve slowly shaved off excess spending categories over many years. While that may not be the most rapid way to increase your financial independence, it’s the reality for us. 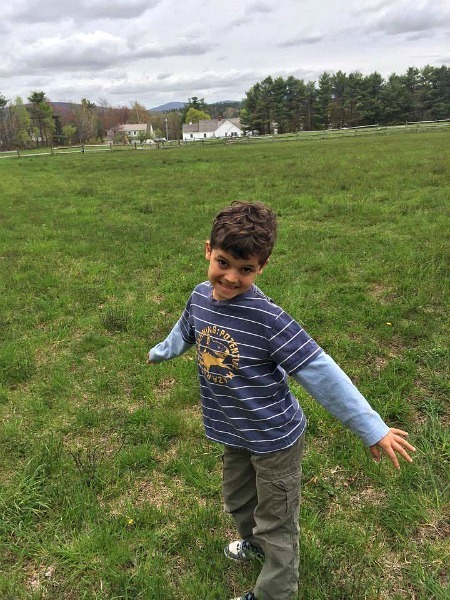 Learning to be frugal and hardy in New England! So does that make us bad at frugality and personal finance? I would argue that sometimes, the very best way to make lasting changes in your life is by the “wood planing” method, whereby you slowly but consistently shave away at bad habits and replace them with good ones. Some people, like my friends in New England, grew up with frugal examples all around them. Frugality comes naturally to them, just as naturally as packing themselves a sandwich when they head for the park. For those of us who didn’t grow up around such financial restraint, but still aspire to a bit more financial stewardship than we currently possess, what else are we going to do? Suddenly, magically change our stripes? I tried but I couldn’t. I still went to the mall and bought a shirt when I was having a bad week, leaving good budgeting intentions to the wind. We still ate out. Those fluffy, spendy ways were something I’d grown up with, and I wasn’t able to change overnight. But we persevered. We didn’t give up. Even though we overshot our budget month after month, we still paid down our debt, slowly but surely. Eighteen months passed, and through a combination of earning extra money, applying that money to debt, some generous gifts, and downsizing, we paid off our debt and began to build positive net worth. How did the planing method work for us? When we first got serious about attacking our debt, we felt overwhelmed. What should we tackle first? Where could we find extra money? Because I had quit working the year before, it already felt like we’d tightened our belts tremendously, as we had to learn to live on 40% less income. We quickly figured out there were two main ways we could “find” extra money–sell big stuff, and pay our debts before buying anything else. Mr. ThreeYear sold his Acura and paid cash for a smaller car. We sold several extra computers we had and put the $400 that gave us toward the debt. We figured out that if we paid a debt payment first thing in the month, we somehow “magically” still had enough to live on. As the months and years passed, I found myself challenging one budget category at a time. When we moved to New Hampshire, we ditched our outsourced services like yard service and pest control. We cancelled our Verizon contract and signed up for Republic Wireless. When we couldn’t get dependable service, Mr. ThreeYear let his workplace pay for his cell phone and I got the cheapest plan from Verizon. We cancelled our cable and replaced it with Netflix. Now, as each year passes, we review our major expenses like insurance to see if we can find cheaper providers. We’ve now gotten insurance costs down to around $100/month through shopping around. We spend an average of $25 on clothes each month for all four of us, down from $75 per month back in 2010. We’ve gradually found ways to cut these costs by finding great hand-me-down sources for the boys and sticking to a pretty minimalist wardrobe. We also use our Consignment Shop for shoes and shirts. Through the planing method, we’ve gradually increased the amount of money that we save each year. In fact, we spent over $11,000 less in 2016 than in 2015, and we expect to spend less in 2017 than we did in 2016. While we still struggle with spending more than we want at times, our overall spending is going down and we’re becoming more efficient with our money. That, to me, is worth perseverance. Since one of our ultimate goals is financial independence along with location independence, it makes sense to work on our frugality. If we decrease our overall spending, not only will we be able to save more if we spend less each year, we’ll need less in our retirement accounts because we won’t need as much to live on. But we’ve also learned that there are some things we value that we don’t want to cut our budgets for, and we’ve accepted that those expense categories are ways we’d like to use our money in the here and now, and not for the future. Those expenses are mainly food and travel. We also spend a fair amount on charity and helping family, and those are expenses we feel good about not shaving down. 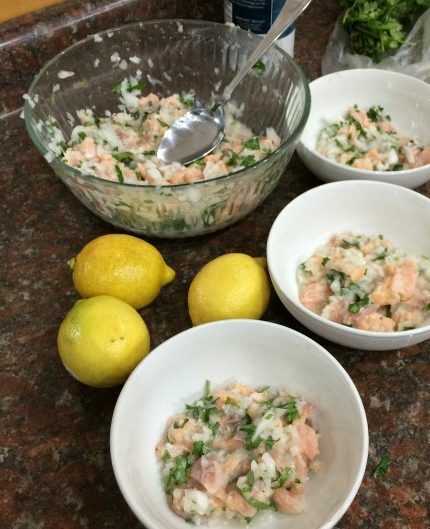 We’re passionate about our food, especially Saturday ceviche. We’ll keep working on improving our frugal habits, knowing that there will be good months and bad months, good years and bad years, but keeping the ultimate goal–doubling our net worth so we can become location independent–in sight. I love the wood planer analogy. I’d agree that making huge, dramatic cuts all at once might look great on paper but not be sustainable in real life. I love experimenting with different frugal techniques – they may not all work long term, but giving them a try means that we may find something that works for us. And I agree with us New Englanders being of hardy stock, although I’m glad that down here in CT we just had cold rain and not snow. 🙂 I just planted some of my plants that can’t handle frost yesterday, I’d be scrambling if we had snow again! I like this post a lot. Thanks for sharing your experience! I’ve lived in Atlanta before and totally agree with you that you need a car to get around. While public transit is the norm in DC, it’s considered a means of transportation for low-income people who can’t afford a car. I didn’t realize how the culture of a city can affect our spending habits as you pointed out. It seems really harsh living in New England. I can see people have different priorities (weathering snow storms) half of the year to survive than showing off their cars.